What are short term binary expiries? Short Term Binary Options Strategy (contracts) come in many flavors; the most popular of them being the 60 second, 2 minutes or 5 minutes and 15 minutes expiry. (read more about Expiry Times) These short term expiry contracts are traded the most due to the fast paced action that they offer. Short term binary options typically payout between 65% – 80% and is mostly available for forex instruments. In this article, you will learn about a few simple strategies that you can use to trade these short-term binary options expiring contracts. The short term binary options expiries are contracts that expire within a short period of time. A trader is paid out a fixed return if the contract expires in-the-money or loses their risked investment if it expires out-of-the-money. On a broader perspective, short term expiries behave the same way as any other long term binary options expiries. The fun and excitement comes from speculating the price moves over a short period of time. Technical analysts in forex often argue that it is a lot easier to predict where price moves in the short term than in the long term. But do not be fooled. It is very easy to get addicted to trading the short term expiries and a trader can quickly lose all of their equity when they take consecutive losses. Below, we outline a few simple to use trading strategies that can be applied to the short term expiring binary options contracts. In forex, it is often said to buy the rumor and sell the fact. This simple logic works very well with short term options. The way to trade short term contracts is to first look for a major news release. This could the NFP that is very volatile and affects most of the majors. It could also be central bank interest rate decisions or even CPI data. The next step is to look for the sentiment. Usually media starts to report about the estimates on such events 24 – 48 hours ahead of the news. If the general sentiment is bullish, then 5 minutes ahead of the news release, make sure to purchase a CALL option. Choosing the expiry time is of importance here as a small miscalculation can lead to a loss. Typically, choose contracts that expire close to the news release time. For example, if a CPI news release is due to be out at 10GMT and the market is expecting a bullish reading, then purchase a CALL option 3 – 4 minutes before the news release. Choose either a 60 second expiry or a 2 minutes expiring contracts. Price usually tends to rally before the news and then drop back after the news is released. 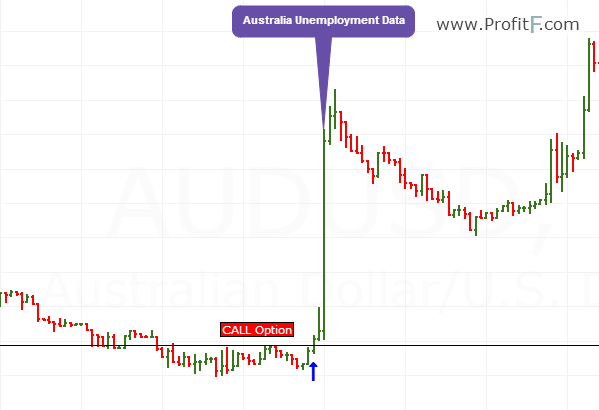 AUDUSD – Unemployment Release: The chart below shows the 1 minute chart of AUDUSD before the Australia Unemployment data was released. Notice how price spiked just around the time the report was released. 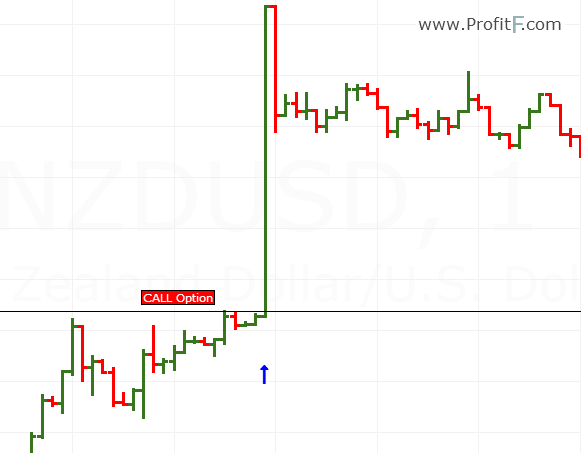 A CALL option around 0.9324 with a 2 – 5 minute expiry would have resulted in a winning trade. But notice the importance of timing here. If the option was a 60 second expiry, it would have resulted in a loss. NZDUSD Unemployment Release: The next example below shows the Kiwi unemployment data. Keeping in line with the buy the rumor sell the fact strategy, notice how price spiked ahead of the news release. The unemployment rate had actually increased from 5.8% to 6%, which is not great news. However, despite the actual release, price rallied before the news was released. In this chart, we see that a 2 minute expiry just before the news release would have resulted in a winning trade. Again, in this chart we would like to stress the importance of timing the trade and choosing the right expiry time. A minute ahead or later would have resulted in a losing trade due to the fast changing price. After making the spike, price moved within a tight range without any direction and it would have caught many traders who were late to the party… or some greedy traders opening new contracts resulting in a losing trade. From the above examples, we see that while it is simple to trade news releases with short term expiring contracts, traders need to get in on a contract at the right time and price. And don’t forget choose regulated Binary Options Broker (see our Top Binary options brokers) A small miscalculation on the timing of the contract expiry or even if the price moved too much before you could enter the contract could jeopardize the chances of having a winning trade. For traders who are just starting out with trading the short term expiring contracts, always trade with the minimum investment amount for the contract so as to keep your losses to the minimum.